My husband is the best when it comes to my quilting addiction. He is supportive and interested, he surprises me with fabric when he travels for work and gets me gifts that would seem completely unromantic (a new ironing board!) to a non-quilter. It’s a lyric from “Maps” by Yeah Yeah Yeahs. And yes, I know the song is about a woman who is trying to keep her man from leaving, but it’s also a song that my husband and I have liked and listened to for almost as long as we’ve known each other. 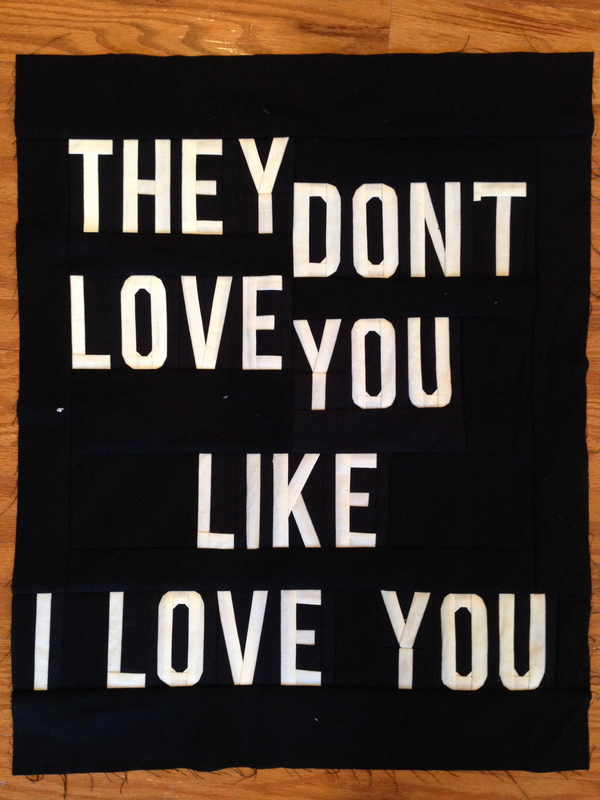 Taken out of context on a quilt it does exactly what I hoped– lets him know that our love is special. It took about 12 stolen, completely secret hours to piece all the letters. A huge thank you to Beth at Rock Paper Scissors who let me use the work room there when I needed to get away from my daily distractions. Part of the gift was that I kept it completely secret– there weren’t even any pictures of the progress, just in case he checked Instagram or happened to use my phone. I cleaned my work area after every sessions and disposed of all the tiny black and white trimmings. I’m terrible at keeping secrets, and this one was really hard, but I did it! I used Diane Bohn’s pattern “My First Alphabet.” It’s so easy to make gorgeous letters, but seriously, these tiny triangles on the Os are not my friends (each letter is three inches tall). 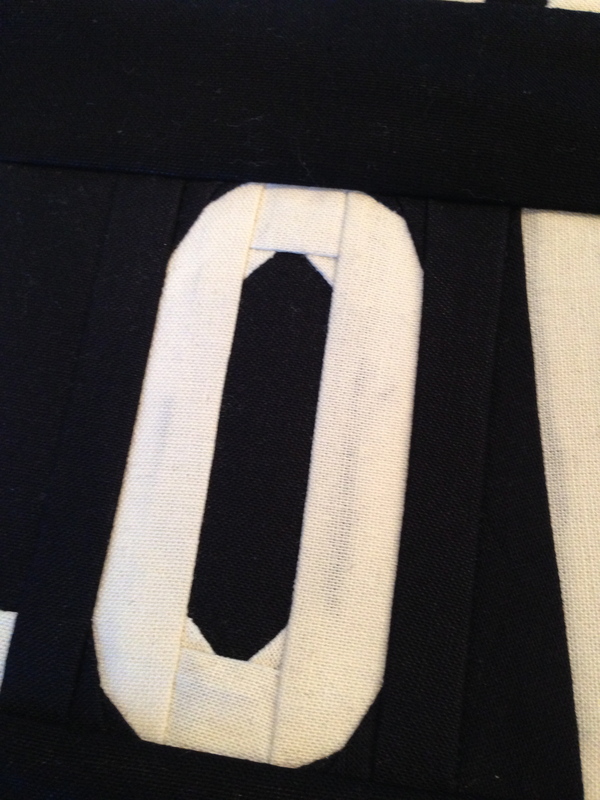 Here is the most important part of the panel with the rest of the fabric I’m hoping to use. It includes two of the fabrics that he bought in Japan, and I might throw a few pops of color in there for good measure. 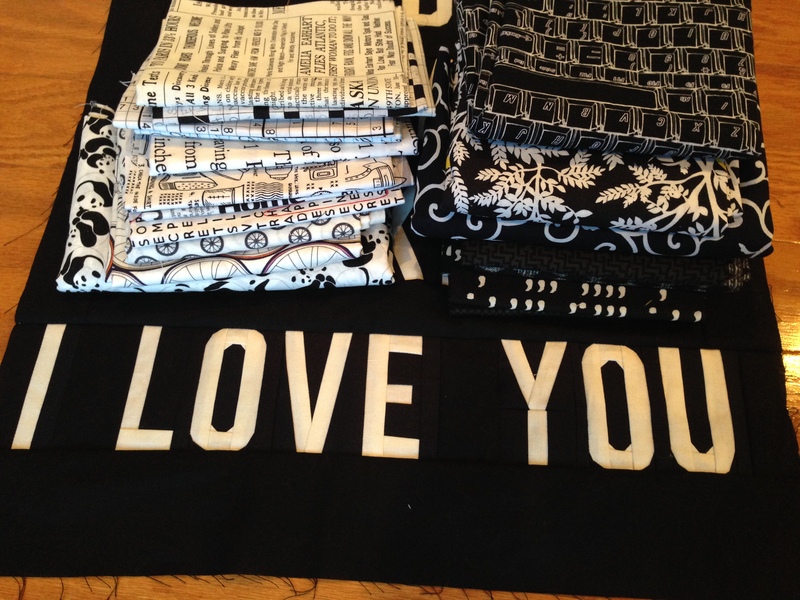 But I love those texty prints, and I’ve been saving my black and white fabrics for something special. This definitely qualifies. I hope you get to spend the day with someone special. wow your lettering/piecing is awesome!! I want to make a secret quilt for my husband, but haven’t figured out the logistics yet, haha. Seriously, that was the hardest part. Thanks! I bet your secret husband quilt will be amazing. Love, love this!!! And I know joe will too. Happy v-day to you both. And to you! It was definitely a hit. Thanks! Now I just have to finish the rest of the quilt!! Isn’t paper piecing fun? It’s just awesome! Love, love, love it! Have a great Valentines’ Day! Now THAT is a proper Valentine! Hand made, with love, and with lots of thought about what it really means. I look forward to seeing the rest of it. Thanks, Kate! I have to get on that. By the way, I can’t get your latest post to open, WordPress says it can’t find it! Sorry, Kate, that post was meant for our guild blog, but I posted it to my own! This is fantastic! Really gorgeous! It’s a testament to my devotion to this project. For anyone else, I would have called mercy weeks ago. Thanks, lady.